Back down in the West Country for a second weekend running, and this time I managed to coax my friend Diane away from work for her first hike on Dartmoor. I had a few ideas in my head of routes to take, and, as is nearly always the case in such situations, the weather determined the one we took, and it was inevitably one I hadn’t considered in the first place! But it was a healthy 27 kilometre circular from Princetown; only a couple of tors to bag, but a wealth of bronze age remains to be seen! After a tasty sausage sarnie in a very busy Fox Tor Cafe, we set out onto the South Moor, in search of the first objective of the day. Back when I was taking my Walking Group Leader assessment, we headed off in this same direction and worryingly we never found the Crock of Gold. I’ll hasten to add that at that point in the assessment, I wasn’t the one navigating, but it was odd that not even the assessor could fathom where it was. To put the matter to rest, I thought we would retrace the steps, and half hour in, with a double check of a GPS, it was obvious we were on the wrong footpath! As was the case all those years ago, we had followed the wrong prong in a fork and ended up half a kilometre from the prize. A tad irked by the error, the prize had to be found and we went off road to find the correct path and more by luck than judgement, went straight to it! The Crock of Gold is a deep cist, and embarrassingly straightforward to find if you take a bit more notice of the map and compass than I had done. For the rest of the day, I displayed a little more attention to my navigation skills. We continued on the now obvious bridleway adjacent to the cist, until we reached a boundary work that we would handrail towards the Whiteworks disused tin mine. We were going to seek out another marked cist along the way, but the heavens opened and the enthusiasm to wander from grassy lump to flat shaped stone in a downpour wains a little. 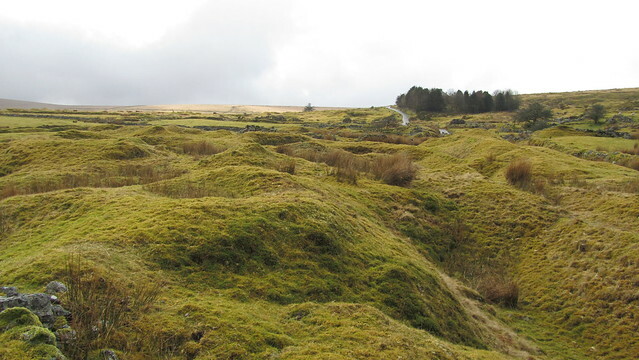 The disused Whiteworks tin mine is a pot marked landscape of green grassy mounds and deep holes, and some deceptively deep ponds coated in a lawn of grass and sphagnum moss; in a heavy mist you could easily find yourself in trouble! We reached the Devonport Leat and followed it to Nun’s Cross Farm. We lost count of the frogs swimming along this section; the amount of spawn suggests there will be even more for spotting in a couple of weeks. At the farm, we met a heavier downpour, and one that we faced full on, when we joined the track to Eylesbarrow Tin Mine. The rain abated after about ten minutes and our clothes dried quickly as we walked. We stopped for lunch at Drizzle Combe. We sat within Giant’s Basin, a fine high cairn with ample room inside for a group to find some respite from the wind. 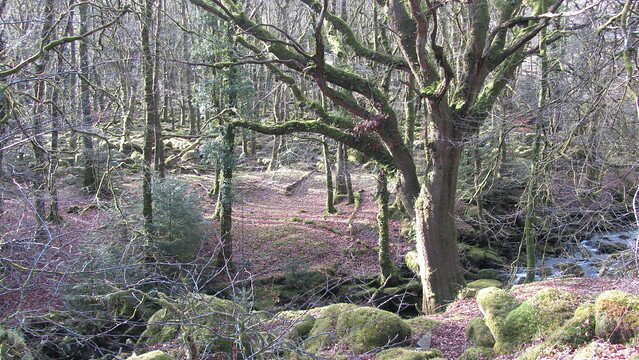 I have been to this part of the moor on many occasions, and wild camped down here twice. 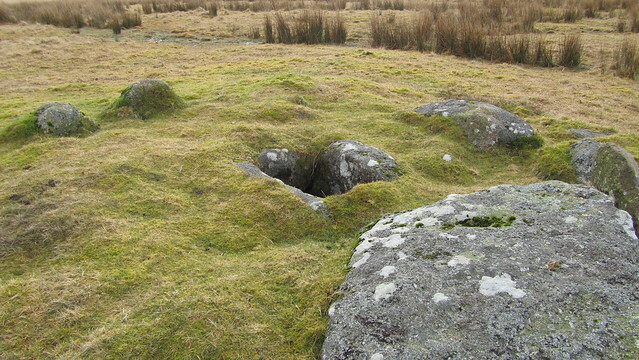 It has a high concentration of Bronze Age remains; large settlements of hut circles, a few cists, as well as some impressive standing stones and stone rows. Next up was Sheep’s Tor, only about two miles away, but a good hour thanks to the terrain. We ascended with a diversion to take a look at the crag. A climber kindly explained, to Diane, the different routes up the granite wall, while his son showed me where to find a couple of letterboxes/geocaches hidden behind the rocks. We carried onto the top, for a view of Burrator Reservoir and a short break before heading for home. As we descended the tor, the sun had emerged to warm our backs. It was turning into a very pleasant day! Down into the Narrator and Norsworthy Plantations, sadly victim of disease and logging but still possessing some picturesque sections. Passed Leather Tor Bridge, we turned right up out on the open moor and up to Crazy Well Pool for a short break before the final push. The final push was to the nearby Crazy Well Cross, then north to another section of the Devonport Leat. Then it is eastwards to a granite slab footbridge where, once crossed, a re-entrant ascending to the north will take you up to a scruffy pond. 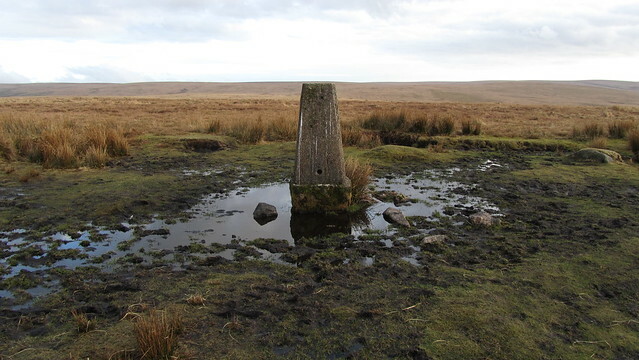 From here, a trig point at 445m can be spotted, and once reached, the track to South Hessary Tor and Princetown is easily defined on a day such as this. Back at the car forty minutes later, a healthy 16.5 miles completed and plenty of interesting things to see, we had definitely earned a curry and a pint!